• In my case the windows update program froze and could not be stopped easily due to a corrupt update (windows or otherwise) causing the windows update program that runs automatically on start up to restart then go back to a frozen state even when your PC is restarted multiple times (the restart worked on similar errors on previous versions but not going from build 10125. Note: To isolate the problem turn off in the windows 10 update box ‘update other programs’ when updating windows. – This prevents any update other than windows 10 from corrupting your windows 10 update. Note: If you want to check to make sure the windows update folder is now replaced (softwaredistribution) you can do this by re doing step 3 and 4 above and you should get an error saying the folder could not be found. This is correct as you renamed in in step 6. Or just look in your root folder and see if C://Windows/SoftwareDistribution.old is there and C://Windows/SoftwareDistribution is not there (per step 3 and 4) if so then you are good to go. 2. 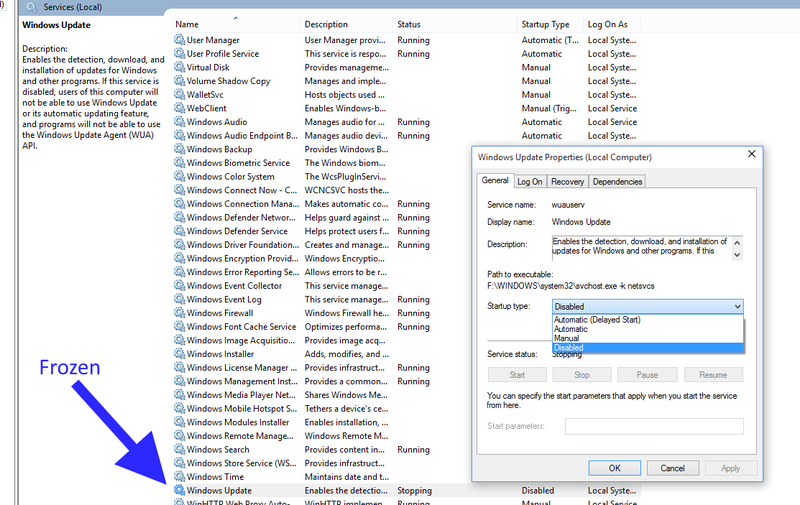 Isolated the Windows Update Server for Windows 10 only by turning off ‘Update other programs’ by turning off the other programs until windows 10 has been updated. Note: The Normal way you could disable then re-enable the windows server is by running CMD ‘Net stop wuauserv ‘ in lieu of step 1, but in my case I got an error saying the windows update server (wuauserv) could not be stopped or was stopping and even when repeated wuauserv was still frozen even after multiple restarts. So step 1 above in this case is a fall back but worked much better.